Taking the hard work out of laundry tasks, our Grundig washing machines are also A+++ rated to save you money on your energy bills. Kinder to the environment, designed to look great and giving you a wide choice of sizes, freestanding and integrated options, there’s a model to suit every home. Whatever your household’s needs, there’s an energy-saving Grundig washing machine that will work for you and your budget. Capacities range from mid-size 7kg to large-drum 9kg. Grundig’s quick wash feature means you can get your clothes squeaky clean in no time, using less energy and saving you time and money. You can wash a 7kg load in 28 minutes and a 9kg load in 40 minutes at 40 degrees. 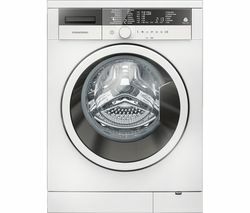 If you’re really in a hurry, the Grundig GWN47430CB’s Mini 14 programme will wash a lightly soiled load in just 14 minutes. Choose from 1400 rpm or 1600 rpm to spin dry clothes and save on drying time. Take care of delicates with the Grundig GentleCare programme, preventing fabric damage and discolouration to make sure that your most valuable and delicate items are well looked after. SenseWash automatically selects the best washing settings according to the size and type of your load, so you’ll never use more water or electricity than you need to. Grundig washing machines come with an anti-allergy programme that is endorsed by Allergy UK, so that allergy or asthma sufferers can enjoy clothes and fabrics that are better protected from house mites, cat and dog allergens, pollen, bacteria and fungi. 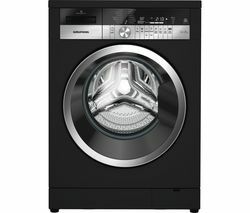 LCD touchscreens, and a range of striking finishes, including black and stainless steel, make these washing machines look the business, and all come with a 5-year manufacturer’s guarantee for added peace of mind. For a wider selection of washing programmes, capacities and help with tumble drying too, take a look at our latest Beko washing machine and washer dryer ranges.